DaveLovesElizabeth.com was fortunate enough to win a Webby Award (thanks to everyone who voted). 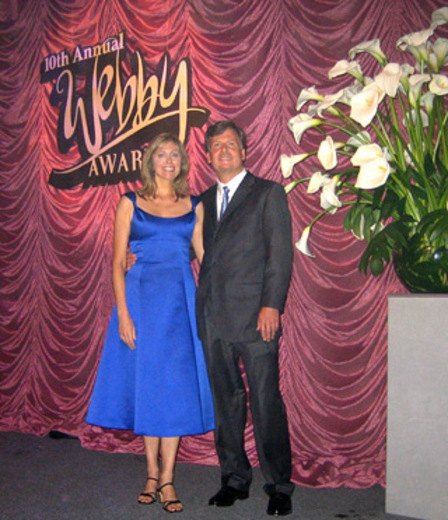 So Elizabeth and I went to New York City for the Webby Award ceremony. The Webbys famously limit acceptance speeches to five words. At the ceremony, CNN interviewed us and asked Elizabeth what her speech would have been (if she'd had the chance to give one). Her response: "You had me at www." CNN liked that so much that they aired her comment. My acceptance speech was, "I proposed, Elizabeth said…" and then I pointed to her in the audience and she yelled out, "Yes!" To cap off the ceremony, Prince performed solo. While nearly everyone else was on their feet, Arianna Huffington, who was at the table next to us, was madly typing away at her PDA. A blogger's work, apparently, is never done. Prince’s performance ended abruptly as he suddenly chucked his guitar back over his head with a crash and raced off to a waiting limousine. One problem: apparently it was not his guitar. As Elizabeth and I were leaving, we passed two anxious-looking Webby workers and heard one say, "I can't believe it--we rented that guitar for him for $4,000. Who's going to pay for it?" The girl that did the CNN interview, Moss I believe. She always does a great funny job. That CNN clip is how I found this page. P.S. I met my husband online... it can work!